Valentine's Day is coming up and love is in the air right now. Have you thought about taking a romantic vacation sometime this year with your partner? In the spirit of love--aka the world's universal language--we're counting down the world's best cities for romance. Visit one of these 15 cities and get ready to fall in love all over again! The ultimate city of love! Nothing beats Paris when it comes to love. Romantic walks down the Seine, picnics in the Jardin du Luxembourg, freshly made macaroons and baguettes, the sparkling lights of the Eiffel Tower... It doesn't get any better than Paris. Come here and fall just as much in love with the city as you are with your honey. This darling Canadian city is the perfect combination of old world charm, natural beauty, and new world conveniences. When you walk through Old Quebec you feel as if you have been transported straight to the 16th century. Stop by areas like Parc National de la Jacques Cartier to take in the gorgeous natural landscapes of the park, and then head to a Nordic spa, like Siberia Spa, to enjoy a little R&R with your partner. This luxurious beach city is located just outside of Puerto Vallarta, Mexico. Punta Mita offers visitors gorgeous views of the Pacific, white sandy beaches, and high-class accommodations like the St. Regis and the Four Seasons (shown above). Come here if you and your lover enjoy relaxing in private cabanas along the beach, hitting the golf course for the day, spending the day at the spa, or seeing a more relaxed, quiet side of Mexico. It's easy to see why so many European artists came to Florence to find their inspiration. This city is so charming and romantic because each corner is cuter than the next. Try some homemade pasta at a local spot, hold hands walking through Ponte Vecchio, eat gelato around the city, or kiss while looking over the Piazza Michelangelo. This refined city in Japan is known for a slower pace of life and classic temples and gardens. See all of the historic Buddhist temples around the city, catch a glimpse of the Geishas in the Gion district, walk through the bamboo forest at Arashiyama, or see the famous gates at Fushimi Inari-taisha. Try to head to Kyoto during cherry blossom season when the trees are all in bloom! Not only is this city incredibly easy to get to from the United States (hello--you don't need a passport! ), but it also boasts some of the most beautiful beaches in the world. Stay in El Convento in Old San Juan--which is an adorbale convent-turned-hotel--and then roam the streets of the old town through the day. Make sure you don't miss Flamenco Beach in Culebra, which is just a short ferry ride away from the coast of the island. It is stunning. Prague is home to beautiful castles, 16th century architecture, cobble-stone streets, and stunning baroque decor. Stroll the streets and grab some food at a local cafe, enjoy some beer over a Czech dinner, or take a boat cruise along the Vltava River. Be sure to check out the Alchymist Grand Hotel and Spa, which is a castle-turned-hotel, for some great romantic vibes. 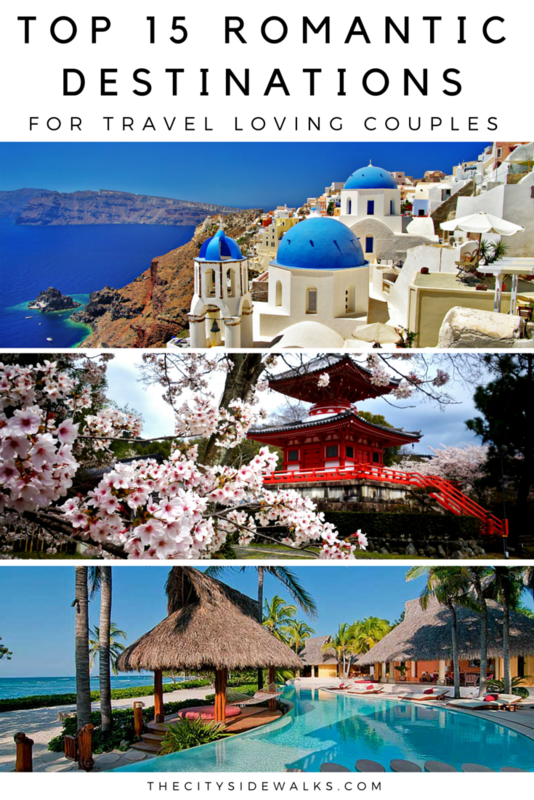 Greece is more affordable than ever to visit, which makes it a perfect time to see the picturesque city of Santorini. Make sure you head to the edge of the town to see amazing views--sunrise, mid-day, and especially sunset--of the coastline. There's no arguing that the white and blue architecture of this town is incredibly dreamy! A lot of people immediately think of Bali when they think of places to see in Indonesia, but there are plenty of other great places to see too! The Togean Islands is an amazing romantic escape for travelers who want a more quiet and less touristy view of Indonesia. Purple sunsets, island life, and beautiful waters. What more do you need? Try island hopping around Karina beach or checking out Bajo Village during your visit. Melbourne is a great city for romantics who love both the city and the natural worlds. Stay in the city center for shopping, great food, and galleries, the Yarra Valley for wineries, or hit up Great Ocean Road for some beaches, backpacking, or camping. If you're into the arts, be sure to check out the Southbank for plenty of things to do! You really can't go wrong with anywhere in the Maldives, but Landaa Giraavaru is home to one of the most luxurious Four Seasons hotels in the world. The Maldives are known for their gorgeous, crystal clear waters, white sand beaches, and romantic cabanas. Stay at a house along the water and be secluded with your partner, or stay at a 5-star hotel and be pampered all day long at the resort. Cotswolds literally looks like a real-life, fairytale town. Rent out a cottage and stroll the streets to see the beautiful town and it's gorgeous natural background. Have a picnic near Hidcote Manor Garden, go to one of the local cathedrals, or walk down Arlington Row. If you have seen Vicky Cristina Barcelona, you know that this city is a must-see for romantics. Barcelona is perfect for roaming the streets to find adorable local spots. Indulge in some Catalan cuisine, take in the gothic style architecture, hit the beach for the day, or wander around Gaudi's Park Güell. This city comes alive at night, so don't forget to take a siesta and go out around 10pm for some tapas to start the night! Even though it is rainy throughout most of the year in Bruges, the rain somehow adds to the charm of this amazing Belgian city. Walk hand-in-hand along the canals, stop in at a chocolate shop, share some waffles or fries at a local spot, or take in some of the unique Gothic style architecture around the city. Grab your dancing shoes and head straight to Buenos Aires for a hot, steamy getaway with your lover. Argentina is oozing with passion--from the food, to the tango, to the streets. The culture is alive and vibrant here, which makes it a must see for romantics. Share tapas over dinner, stroll the streets of La Boca, and definitely give tango a try! What are your favorite romantic cities around the world? List your favorites below! Older Post15 Romantic Getaways in the U.S.